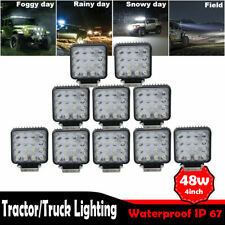 4pcs 18w Pods LED Work Light Flood Lights For Truck Off Road Tractor 12V 24V 4"
Beam Angle: 30 degree (spot beam) &60 degree (flood beam) combo. Beam Type: 30 degree(spot beam)& 60 degree(flood beam) combo. Streamline 312W dual row LED light bar. 6pcs 3W intense CREE LED. 1x 54" 312W dual row Curved LED light bar. • Power: 162W(54pcs x 3W). • Beam pattern :Flood Spot Combo Beam. • Color Temperature:6000K( PURE White ). Beam Pattern: Flood Spot Combo Beam. LED Color Temperature: Pure White 6000K. Certifications: CE FCC IC ROHS IP67. Waterproof Rate: IP67; Waterproof, dustproof, quakeproof and anti-corrosive. Mounting Bracket: Alu firm bracket. Power: 72W. 2x 72W led work light With Mounting Brackets. Beam Type: 30 degree(spot beam)& 60 degree(flood beam) combo. 24pcs 3w high intensity LED. Certified by CE & ROHS. Mounting Bracket: Stainless steel bracket. 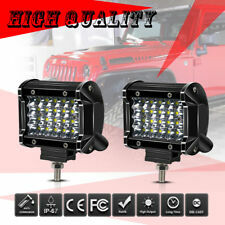 2 pcs 7x6 led healdights. Fit for most vehicle with sealed beam headlights(H6014 H6052 H6054 H5054 H6054LL 69822 6052 6053). LED Power: 126W (42 x 3W High Intensity LED). LED Color Temperature: Pure White 6000K-6500K. LED Power: 30W. 2 X 30W led Work Light With Mounting Brackets. Light Pattern: Spot. LED: 6Pcs 5W Chip LED. Applying to difference light resource(Such HIGH LED Lamp). The glass surface is made of Quart Lens with high light transmission. 4 x 18w LED Light. Beam angle: 60° Flood Beam. Light Color：White. Our goal is to make your choice easier and save your money. 4 x Mounting Brackets. Luminous flux: 1800 LM. LED Power: 18W (6 x 3W High Intensity LED). Beam Pattern: Spot Beam. LED WORK LIGHT. LED LIGHT BAR. Working Temperature: -40~85 degrees Celsius LED Color Temperature: Pure White 6000K-6500K. NOT D.O.T. approved. LED Color Temperature: Pure White 6000K. Our goal is to make your choice easier and save your money. Color Temperature: Pure White 6500K. Plug Type: H1, Single Beam. 2X H1 Led Headlight Bulb & 1 X Manuel & necessary accessories. Beam Angle: 360 Degree. Our goal is to make your choice easier and save your money. TURBO SII D6 Series Super Bright High Low Beam LED Headlight Bulb Conversion Kit. 2x9005 HB3 Bulbs Headlight Screwdriver 2 Ribbons User Manual. DOT Approval-Designed to Conform DOT FMVSS-108. This item is compatible with universal vehicles: Car, SUV, ATV, VAN, Pickup Truck, Bus, Wagon etc. Beam: flood 60 DegreeC. LED Watts: 36W (12pcs 3W high intensity LEDs). The super bright landscape area is clear at night and has excellent visual effects. Long Service Life: The energy efficient design paired with a quick cooling heat sink effectively extends the Bar's life-span beyond 50,000 hours. LED Power: 126W (42 x 3W High Intensity LED). Beam Pattern: Spot Flood Combo Beam. You can see further and have wider vision with the appropriate combination of spot beam and flood beam. 4x4, Cars, Trucks, SUVs, ATVs, Boats, etc. 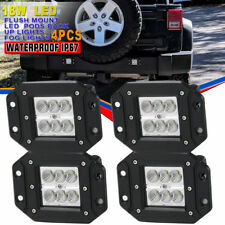 50 inch 288W Curved LED Work Light Bar KIT Combo Offroad Dodge PROMASTER CITY. • Power: 162W(54pcs x 3W). 1 X 162W Work Light. • Beam pattern :Flood Spot Combo Beam. Led headlight. Led Light bar. JK Light bar. 3D lens light bar. Adjustable bracket light bar. 360 Degree Adjustable Beam Angle 6000K White Light Source. Beam Pattern:H1 Single Beam. 2x H1 LED bulbs Headlight Screwdriver 2 Ribbons User Manual. TURBO SII D6 Series Super Bright High Low Beam LED Headlight Bulb Conversion Kit. 2x H8 H9 H11 Dual Beam bulbs. 360 Degree Adjustable Beam Angle 6000K White Light Source. TURBO SII D6 Series Super Bright High Low Beam LED Headlight Bulb Conversion Kit. DOT Approval -Designed to Conform DOT FMVSS-108. Its surface cover is designed to be streamline curved with etched patterns. Fashion Cool Illuminated Rocker Switch. 1x 5 Pin Rocker Switch. Surface size is 2" (50mm) x 1"(25mm). Standard size mounting hole 1.41"(36mm) x. 86"(22mm). 2x H4 9003 HB2 bulbs Headlight Screwdriver 2 Ribbons User Manual. 360 Degree Adjustable Beam Angle 6000K White Light Source. TURBO SII D6 Series Super Bright High Low Beam LED Headlight Bulb Conversion Kit. Power: 36W. Beam Angle: SPOT beam (30 degree). Each LED is independent,so light bar will still works fine if only one or two LED fails. Each LED is sitting in their patented reflector assembly,runs at 93% optical efficiency. LED Power: 312W. 1 pcs 312W Led Light Bar. 1 pcs Rocker Switch. 1 pcs 3 lead wiring harness kit. We will reply in 24 hours and fix the problem. LED Power: 30W. 2 X 30W led Work Light With Mounting Brackets. Light Pattern: Spot. Applying to difference light resource(Such HIGH LED Lamp). LED: 6Pcs 5W Chip LED. LED Work Light. LED Headlight. The glass surface is made of Quart Lens with high light transmission. Power: 27W 9pcs 3W high intensity LED. 20 x 27W led work light. Beam: Spot Beam(60 degree). Our goal is to make your choice easier and save your money. Low Current Draw, no harms to battery and save gas. H4 LED Headlight Hi/Lo Beam 2x H4 LED Headlight Hi/Lo Beams. Beam Angel: 360 Degrees. Super bright Bridgelux COB chip,360 degree clear beam no blind zone. (2pcs/set) Bridgelux COB LED headlight conversion kit. Power: 72W. 2 x 72W led work light. Beam Type: 30 degree(spot beam)& 60 degree(flood beam) combo. Our goal is to make your choice easier and save your money. Streamline dual row LED light bar,relieve LED light bar from dull bulky shape. Power:300W (100pcs High Intensity LED). Worldwide famous LED,profile can fit any narrow place. LED Watts: 18W(6pcs 3w high intensity LEDs). 2X 18W White Single Row LED Light. Optional Beam: Flood beam, 60 degree. 2X Adjustable Mounting Brackets Screws Set. Our goal is to make your choice easier and save your money. (2pcs/set) Bridgelux COB LED headlight conversion kit. Super bright Bridgelux COB chip,360 degree clear beam no blind zone. H4 LED Headlight Hi/Lo Beam 2x H4 LED Headlight Hi/Lo Beams. All-in-one heat conduction high speed mute fan system keep the light bulb in appropriate working temperature.